Hair follicles can be damaged in many ways. Scarring alopecias (also called cicatricial alopecias) are a group of hair loss conditions whereby the body forms small scars around the hair follicles. These include conditions such as lichen planopilaris, frontal fibrosing alopecia, folliculitis decalvans, central centrifugal alopecia. Each specific diagnosis within this category is fairly rare, but some examples include dissecting cellulitis, eosinophilic pustular folliculitis, follicular degeneration syndrome (previously called “hot comb” alopecia), folliculitis decalvans, lichen planopilaris, and pseudopelade of Brocq, to name a few. Scarring alopecia may also be part of a much larger condition such as chronic lupus erythematosus, where many organs of the body can be affected. 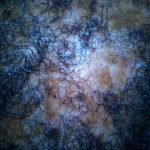 While there are many forms of scarring alopecia, the common theme is a potentially permanent and irreversible destruction of hair follicles and their replacement with scar tissue. Lichen planopilaris: Common symptoms include itching, burning, and pain. Central centrifugal cicatricial alopecia: Patients report slow onset of hair loss without symptoms. Pseudopelade: Patients report slow onset of hair loss without symptoms. Traction alopecia: Patients report slow onset of hair loss without symptoms. Lipedematous alopecia: Patients report slow onset of hair loss without symptoms. Alopecia mucinosa: Patients report dyshidrosis and dysesthesia. Chemotherapy alopecia: Alopecia may occur accompanied by a sensation of tingling. Cytotoxic effects on hair follicles result in temporary hair loss starting within 4 weeks of treatment initiation. Discoid lupus: Patients often have a history similar to persons with cutaneous discoid lupus, which may include a sensation of itchiness and tenderness in the region. Acne keloidalis: Patients report of itching, burning, and tenderness. Acne necrotica: Patients report of itching, burning, and tenderness. Erosive pustular dermatosis: Patients often have no symptoms. If the scalp region is tender, suspect malignancy. Pressure alopecia: Patients usually report itching and dandruff. Senescent alopecia: Patients often have a normal full head of hair through age 40 years. A dramatic, diffuse thinning is then noted. The immune system reacts to anything it considers harmful to the body. It responds by unleashing white blood cells then attack the invader relentlessly until it’s been destroyed. The reason why the immune system attacks hair follicles is unclear – there certainly doesn’t appear to be any genetic link. 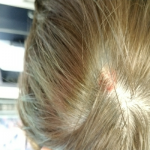 Scarring alopecias (also called cicatricial alopecias) can be either a primary process, whereby it directly attacks the hair follicles, or a secondary process, whereby it indirectly attacks the hair follicles. This type occurs when immune system initially reacts to something like a serious burn, but then targets hair follicles as well. But, which type it is, the outcome is always the same – the hair follicles are completely destroyed causing permanent hair loss and tissue scarring under the skin. In most cases, this tissue scarring won’t be visible on the skin surface. If an injury is bad enough, the hair follicles can be damaged and new hair won’t grow. The actual mechanism taking place that causes this scarring alopecia always seems to involve destruction of the top section of the hair follicle – in other words, near the skin surface rather than the lowest part (the root) which actually grows the hair shaft. But, this top section includes the bulge region, which is a very important part of a hair follicle because it contains stem cells. And the migration of these stem cells down to the base of the follicle is vital for the hair’s survival during the next hair growth cycle. The treatment of these conditions varies. Most treatments are considered off label. Stimulating hair growth using options often considered for nonscarring alopecia has been attempted with mixed results, and these include finasteride, minoxidil topically, and bimatoprost injections. In general, with both scarring and nonscarring alopecia, early intervention is best. Primary treatment is focused on anti-inflammatory modulation. More common medications used are monthly intralesional triamcinolone acetonide at 3-10 mg/mL, prednisone, and systemic retinoids, although hydroxychloroquine and other immune suppressants (particularly mycophenolate mofetil) are also used. Symptoms or histologic evidence of inflammation has been reported to improve with daily use of a potent topical corticosteroid and tetracycline. Patient education and behavioral modification are most critical. Sun avoidance is a common suggestion for lupus patients. Class II corticosteroid creams are more efficacious than class VII preparations, and approximately half the patients have improvement with hydroxychloroquine. Acitretin has also shown good results, although with increased adverse effects. Several other treatment modalities have been advocated. These include concurrent topical class I or class II steroids along with intralesional triamcinolone acetonide (10 mg/mL every 4-6 wk). Hydroxychloroquine is also commonly used as part of the treatment regimen. Clinical improvement is often seen within 4-8 weeks, with the full extent of benefit not evident for several months. A bridge of anti-inflammatory prednisone orally is sometimes used for the first 3 months. Early disease can be controlled with topical steroids and topical antibiotics. Intralesional steroids, laser ablation, and retinoids have also been used. Surgical excision can also be effective. Empiric oral tetracyclines or antistaphylococcal agents, antibacterial shampoos, and even oral retinoids may produce results. Topical steroids have been reported to be effective. Also phototherapy, topical psoriatic medications used. Anecdotal reports have noted use of topical/oral steroids, topical/oral retinoids, and dapsone. Baseline and routine ophthalmologic examination may be warranted. Combination antibiotic treatment including rifampin can sometimes produce sustained disease-free remission. Rifampin (600 mg twice daily) and clindamycin (150-300 mg twice daily) are commonly used together. Sustained relief can also be obtained through the use of topical corticosteroids together with an oral tetracycline. Despite the lack of multiple medical options for the treatment of end-stage scarring alopecia, achieving cosmetically acceptable correction of alopecia by means of surgical hair transplantation procedures (eg, punch grafting, flap rotation) is possible. Stress and psychiatric morbidity are common considerations to evaluate. Consultation with a psychiatrist is helpful.